I will never share your email address with a third party. The purpose of capturing your email is to deliver high quality articles and resources to you on a weekly basis, with the occasional promotion of my online blogging course. All emails sent are compliant and have an opt out link at the bottom of each email. To be inline with the FTC blog disclosure policy, I want to let you know that I do occasionally write about great products or services that I am an affiliate of. As an affiliate, I receive a commission for each sale or lead. My blog content drives the primary source of my income, and I have the right to promote products/services at my discretion as long as I clearly state above the fold that the blog contains affiliate links. In addition to the disclosure statement, I also place an asterisk next to each link that is an affiliate link. I focus on promoting products and services that I truly believe will help my readers. I will always give my personal opinion of the product or service, and I will never be influenced by the affiliate to use language that I do not truly believe. Here are the disclaimers associated with my blogging course. 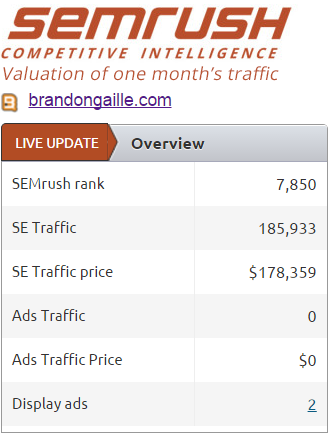 The verified value of the monthly traffic of the keywords that drive that traffic is $178,359. Website properties are typically sold on a 2 to 4 year multiple of this number. This places the value of my blog between $4,280,616 and $8,561,232. The website statistics that are listed on the course page are all from sites that are either clients of Brandon or owned by Brandon. This allows me to have complete access to the analytics so that I can see that the results were obtained directly from traffic coming from blog posts that were using my system. Each of these are examples and individual results will vary based upon a number of variables. I do not make any claims that these are typical results that consumers have. Although the name of the course is “The Blog Millionaire,” it does not mean you are going to become a millionaire by being a blogger. It is a name to reflect that the blogging course is based on strategies from many bloggers who have built seven figure companies because of the traffic that they receive from their blogs. There is no guarantee that you will have any financial gains from using the tactics covered in the course. The information on the course is not meant to be interpreted as any promise of guarantee of earnings. The overall earning potential is wholly dependent on the individual that uses the product, ideas, and tactics. What determines success is largely based on the amount of time you devote to the course, your business finances, and personal knowledge base. Because of this, we cannot guarantee any success of income attributed to the course.